Theodore McQuilkin's friend, a professional poker player who would know these things, advised against McQuilkin playing the €1,650 Six-Max at World Series of Poker Europe. It would be one of the toughest fields of the series, he told McQuilkin. McQuilkin himself admitted he isn't the biggest fan of the format. Still, he took a shot. And boy, did it pay off. 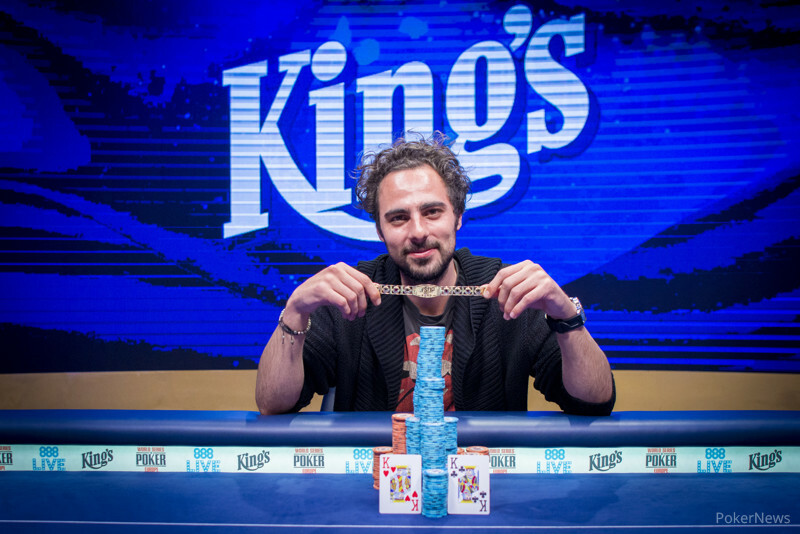 The 24-year-old recreational player from France made it through a 240-player field to take down the €88,043 first-place prize and a gold bracelet. He bore a wide grin as he posed for his winner's photos. "It's awesome," he said. "I'm not a poker professional at all but I love playing poker. It's a real passion." McQuilkin admitted that his friend's reservations proved spot on — it was the toughest field in which he'd competed. Used to playing full ring private games a few times per week, McQuilkin found himself immersed in a series of tough hands against formidable opponents. "Every table was very hard," he said. "Each decision was very, very hard." Still, McQuilkin made it to the final table, although he was sitting just fifth of seven when Day 3 began. McQuilkin mostly sat our early but seemed to get his sea legs under him when he got a bluff through after floating against Andrej Desset in a medium-sized pot. 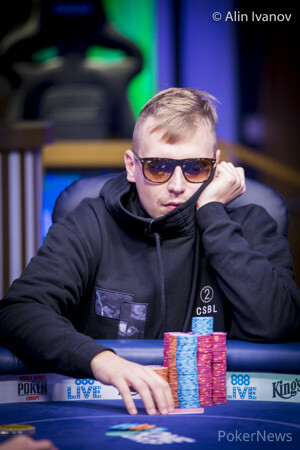 Shortly after the official final table got underway with the elimination of Ognjen Sekularac, McQuilkin eliminated Maksym Shulga when tens held against pocket fours after Shulga jammed over a raise for nearly 20 big blinds. Jan Bednar looked like he wanted to be table captain, and when he surged into the lead after busting Petr Setka in fifth, the Czech player began ratcheting up the aggression. However, McQuilkin didn't back down, playing back both when he had and when he didn't. Of course, it also helps to get dealt big pairs when shorter stacks are pushing small pairs. That's what happened again when Jerry Odeen raised with fives and four-bet shoved his remaining chips over McQuilkin's three-bet. The Frenchman called with jacks and took command of about two-thirds of the total chips. It took less than 30 hands for McQuilkin to roll through his remaining foes, Bednar and Andrej Desset, hitting Bednar with a heads-up cooler when pocket kings held up against ace-queen. McQuilkin was certainly dealt more than his share of big hands at the final table, and it didn't go unnoticed by the freshly minted champ. "I have to say, I was running good," he said. A player with only about $24,000 in live cashes coming into the event, McQuilkin said he's been getting away from home in Strasbourg, where he co-owns a real estate company, to travel the European circuit when he can. It hadn't exactly filled his pockets with dough, but McQuilkin enjoyed the travel and the poker, so he kept at it. 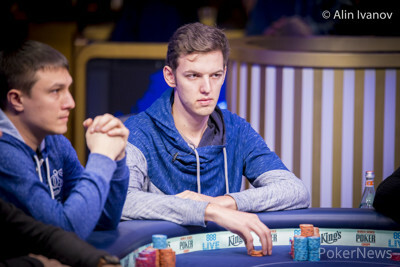 McQuilkin headed to Rozvadov for the weekend, and after he bagged Day 2 and zeroed in on the final table, he begged his poker-playing buddy to come sweat him. "I told him I have a special feeling, please come," McQuilkin said. Eventually convinced, the friend came out, and hours after McQuilkin picked him up, the two posed for a winner's shot together. "My feeling was right," McQuilkin said with a smile. While McQuilkin admitted he'd like a more robust celebration, he'll be keeping it mild. After all, the streets of Rozvadov aren't exactly lined with rocking clubs, and he's got to get back to Strasbourg tomorrow to be ready for work on Monday. "We're going to drink a very nice bottle of whiskey," he said. Hand #110: McQuilkin raised to 165,000 on the button with and Bednar raised all in with . McQuilkin called and Bednar could only shake his head and hope for an ace. The board ran out , giving McQuilkin a flush and the win. Bednar, who entered today as the chip leader, takes home second place for €54,410. McQuilkin will take home the €88,043 first prize and his first WSOP gold bracelet. Hand #109: Jan Bednar limped the button with and Theodore McQuilkin checked his option, holding . The flop came and McQuilkin check-called 65,000. The turn was the and both players check. The river was the and McQuilkin checked a third time. Bednar took a moment before betting 80,000. McQuilkin called fairly quickly and won the hand with his two pair. Hand #108: Bednar opened the button to 155,000 holding and Desset called for less with . The board ran out and Desset was eliminated in third place. He will take home €35,714 for his finish. Bednar and Theodore McQuilkin are now taking a one-hour dinner break before starting heads up play. Hand #101: Everyone saw a flop for the minimum. Everyone checked and the hit. Theodore McQuilkin bet 75,000 with and Jan Bednar called with . The river was a and Bednar checked. McQuilkin fired 325,000 and Bednar paid off. Hand #102: Bednar raised to 125,000 with . McQuilkin looked at in the small blind. He shipped all in and won the pot. Hand #103: McQuilkin raised to 150,000 with and got no action. Hand #104: Andrej Desset opened to 135,000 with . McQuilkin defended big blind with . The flop prompted a check from McQuilkin and a check from Desset. The turned and McQuilkin bet 105,000. Desset called and the river was a . McQuilkin fired 460,000 with his straight and took it down uncontested. Hand #105: McQuilkin completed the blind with . Desset woke up with and shipped. McQuilkin folded. Hand #106: Bednar got a walk. Hand #107: Desset shoved all in with for 1,150,000 and Bednar called for less with 745,000, holding . The board ran out and Bednar earned the double up on the river. Hand #98: Jan Bednar completed from the small blind with and Theodore McQuilkin raised with and Bednar folded. Hand #99: Bednar opened the button to and McQuilkin called with before Andrej Desset shoved all in with both players folded to Desset’s shove. Hand #100: McQuilkin opened to 135,000 with and Bednar called with . The flop was and Bednar checked. McQuilkin bet 105,000 and Bednar called. The turn was the and Bednar checked again. McQuilkin bet 460,000 and Bednar called. The river was the and both the players checked. McQuilkin won the hand. Hand #92: Jan Bednar completed with and folded to a raise from Theodore McQuilkin, who had . Hand #93: McQuilkin was dealt again and jammed. Andrej Desset folded . Hand #94: McQuilkin opened on the button and won the pot. Hand #95: Desset (button) and McQuilkin (big blind) saw a flop for the minimum and checked. The turn was a and McQuilkin bet 75,000. Desset called. the river brought a and McQuilkin check-called 265,000, mucking to the nines up. Hand #96: Bednar opened with on the button and won the pot. Hand #97: Bednar got a walk. Hand #87: Theodore McQuilkin raised from the small blind with and Andrej Desset called from the big blind with . The flop came and McQuilkin bet 115,000. Desset called. The turn was the and McQuilkin bet again, this time making it 250,000 to go. Desset called. McQuilkin checked the river when the hit the river and Desset checked behind. Desset won the hand with ace high. Hand #88: Jan Bednar got a walk. Hand #89: Desset limped with and Bednar called from the small blind. McQuilkin raised to 210,000 with and everyone folded. Hand #90: Bednar raised to 125,000 with and Desset called from the big blind with and the flop came . Desset check-called 75,000. The turn was the . Desset checked again and Bednar bet 230,000. Desset folded. Hand #91: McQuilkin opened to 130,000 with on the button. Desset reraised from the small blind with , making it 390,000 to go. Bednar folded and McQuilkin shoved all in and Desset folded.